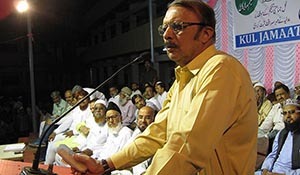 Mumbai: Asadudin Owaisi, Hyderabad MP and President of All India Majlis-e-Ittehadul Muslimeen (AIMIM) on Friday said had former ATS Chief Hemant Karkare been alive, he would have been arrested by the Modi government in New Delhi. 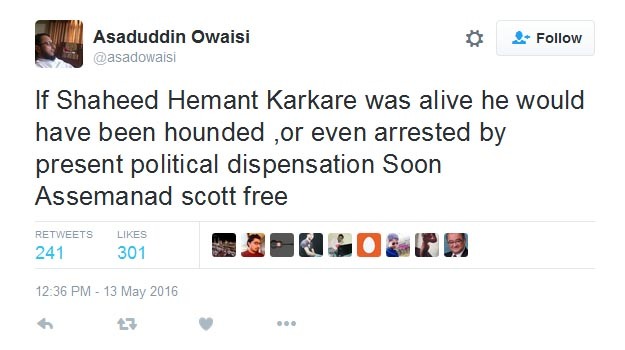 Owaisi also feared that Aseemanand, one of the accused the 2008 Malegaon blast case, would soon be set free. "If Shaheed Hemant Karkare was alive he would have been hounded ,or even arrested by present political dispensation Soon Assemanad scott free", Asaduddin Owaisi tweeted Friday. Hemant Karkare, former ATS Chief, was killed in 2008 Mumbai terror attack. Aseemanand is one of the accused in 2008 Malegaon and Hyderabad Makkah Masjid blast. 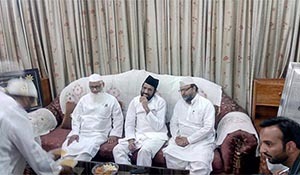 The Muslims arrested in Hyderabad Makkah Masjid and 2006 Malegaon blast cases were set free following the confession of Aseemanand. Owaisi's tweet came in response to the NIA chargesheet filed today which did not name Sadhvi Pragya Singh Thakur as accused and also dropped charges under the stringent Maharashtra Control of Organised Crime Act (MCOCA) against Purohit and all other accused. Owaisi had earlier accused the NIA of playing politics at the diktat of the political masters and on the dead bodies of 37 people who were killed in the blast. 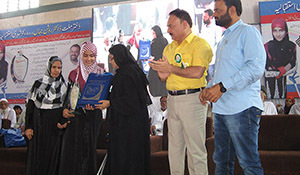 While interacting with mediapersons at the party headquarters Darussalam in April on NIA’s latest move opposing the discharge application of nine Muslims arrested in the Malegaon blast case. ‘’Now the trail will run on what basis? 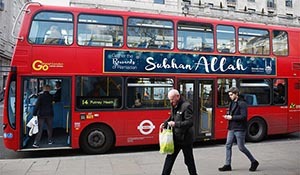 Who are the main perpetrators Nine Muslims or eight Hindus? How will the trail run now? he questioned. 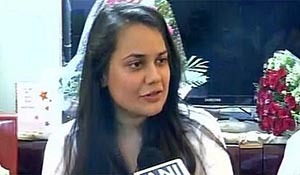 Meanwhile, strongly criticising the BJP Government in New Delhi for intruding in the impartiality and independence of National Investigation Agency (NIA) by dropping charges against Sadhvi Pragya Singh Takur, Lt. Col. Purohit and others in the Malegaon blast case, Welfare Party of India (WPI) said it would result in serious consequences. "Role of right wing Hindutva forces was convincingly established by then Joint Commissioner of Mumbai ATS Hemant Karkare who lost life in the 26/11 Mumbai attack. Even his integrity is being questioned now", Party national president Dr. S.Q. R. Ilyas said expressing apprehension of people losing their faith in institutions of government. "It is ridiculous that the same NIA that had vehemently objected to bail applications of Sadhvi, Purohit and others many times is taking a U-turn by diluting the blast case that took the lives of six people", he added. "Welfare Party wants to caution the government not to play with the institutions and agencies of the nation", he said. They will now be charged under provisions of the Unlawful Activities (Prevention) Act and the chargesheet will be filed in the UAPA court in Mumbai. "The chargesheet has been filed. We are about to get the copies. 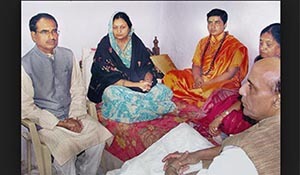 They have recommended to discharge four people, including Sadhvi Pragya Singh Thakur," defence lawyer Sanjeev Punalekar said. Besides Sadhvi Pragya, Praveen Takkalki and two others have also been discharged in the case. 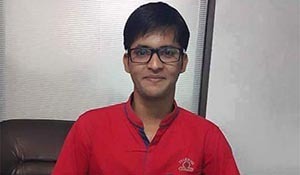 "During investigation, sufficient evidences have not been found against the below mentioned persons and NIA has submitted in the Final Report that the prosecution against them is not maintainable -Pragya Singh Thakur, Shiv Narayan Kalsangra, Shyam Bhavarlal Sahu, Praveen Takkalki, Lokesh Sharma and Dhan Singh Choudhury," the NIA said in its chargesheet. "Some people want to move to court against the discharge recommended. We are challenging them," he added. The Congress on the other hand alleged that Malegaon blast accused were being set free because they have links with the BJP-led central government. “The central government wanted to save Malegaon (blast case) accused as they have connections with them,” senior Congress leader Digvijaya Singh told the media here. The Supreme Court had on May 6 directed the NIA to file a chargesheet against Lt. Col Srikant Purohit, former military intelligence officer and an accused in the case. 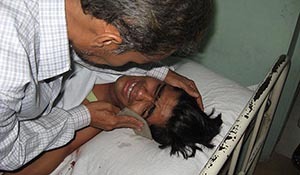 Six people were killed when a powerful bomb fitted in a motor cycle, allegedly owned by Sadhvi Pragya Singh Thakur, exploded in a crowdy market on Malegaon during the Holy Month of Ramadan on September 29, 2008. It was the first major case in which the involvement of right-wing Hindu extremists came to the fore.